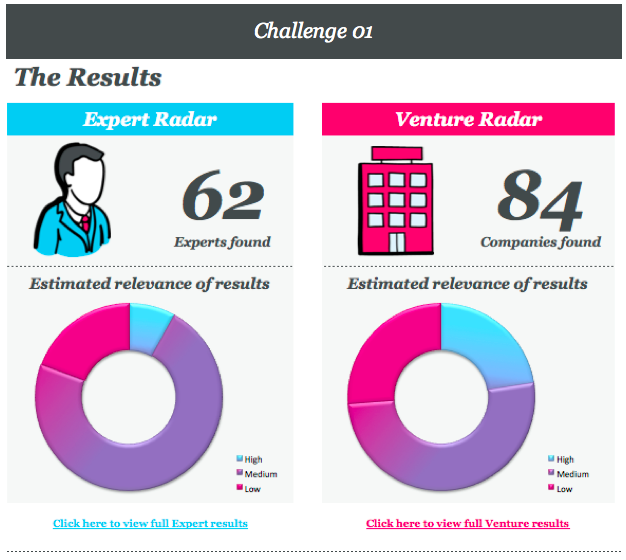 Innovation Radar – who don’t you know? Those responsible for bringing new products and services to market are under increasing pressure to improve their innovation hit rate and do so more quickly. Though some may have a well-established innovation process, clients often lack the right partners to collaborate with, and lose out on the benefits of open innovation than can be achieved by innovating together. 100%Open’s Innovation Radar service provides a rapid and effective look beyond your own boundaries to find new technologies and catalysts for innovation: unmet needs, knowledge domain experts, exciting new companies. This service delivers a smarter way to discover things that would otherwise take you longer and cost you more. And the activities that support this approach can be tailored to suit your organisation’s innovation process and methodology. Our service is driven by our proprietary Company Discovery Engine which includes unique web search system and a database of more than 100,000 companies, including university spin-outs and venture capital-backed companies. In addition our open innovation team help to frame and filter searches and results, and interview potential partners to ensure the best possible collaborations. Scale and speed: Our Company Discovery Engine scans millions of web sources for relevant candidates and we cover all sectors on a global scale. We can locate solutions within your speciality area and source transferable solutions from other industries. These are prioritised according to customisable criteria and supplemented by our own extensive contacts through all the major social media channels. Consistent process: Our pro-active methodology is equally applied across all sectors, meaning we can offer an efficient and consistent standard of results from search to search. Cross-sector solutions: We cover all sectors, meaning we can locate solutions that may not be in obvious sectors or are outside your area of expertise. Confidential service: All our searches are carried out in confidence, meaning that there is no need to publicise the nature of your internal development efforts or competitive weaknesses. It’s like crowd-sourcing without the crowd knowing.